Overcast with showers at times. Thunder possible. Low 52F. Winds SSW at 10 to 15 mph. Chance of rain 40%..
Overcast with showers at times. Thunder possible. Low 52F. Winds SSW at 10 to 15 mph. Chance of rain 40%. On Sunday, April 14 at the Mebane Historical Museum, there will be a program recollecting the life and times of the late Bushy Cook. 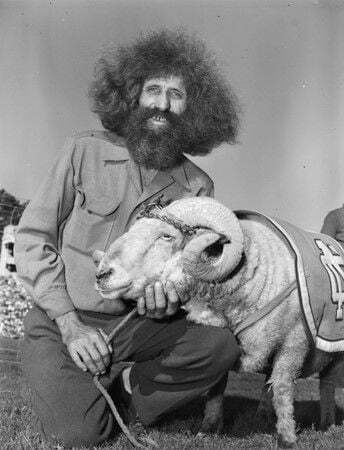 Cook was most well-known for being the caretaker of UNC-Chapel Hill's athletic mascot, Rameses, the live ram that walks the field at home football games at Kenan Stadium. But there was much more to this well- remembered man that may surprise many. Find out about the man beneath the hair on Sunday, April 14, 2019 at 3:00 p.m. This program will be presented by a relative of Bushy, Phil Mace. Sunday, April 14 - 3:00 p.m. Even by today’s standards, heads would likely turn if one were to run into George Braxton in downtown Mebane. Tall, lanky, and sporting a spectacular head of hair and beard to match, “Bushy” was a well-known local character. Mascot Ramses. But there was much more to this well- remembered man that may surprise many. Find out about the man beneath the hair on Sunday, April 14, 2019 at 3:00 p.m. This program will be presented by a relative of Bushy, Phil Mace.